Revlon polish is so nostalgic to me. It's one of the first brands of nail polish I ever used. I've read some say they wish Revlon would update their bottles, but I wholeheartedly disagree. Their bottles are easily recognized, unique (even if they are old fashioned), and they put the name of the polish on top. And I love that. When I open my Revlon drawer in my Alex I can easily find the color I want. Which is really nice when you have a large collection of polish. 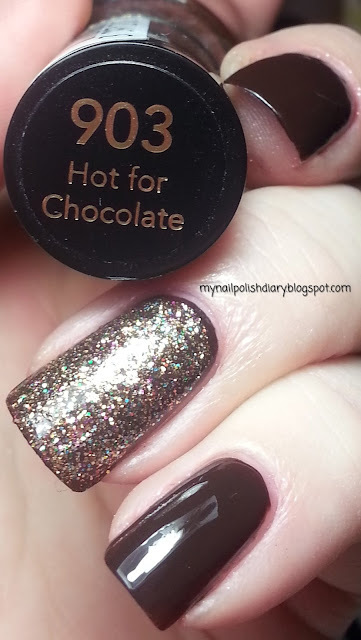 Revlon Hot For Chocolate is a brown creme. I think it's part of their core line. I'm not sure. I've had this for a very long time. There's nothing really spectacular about it. Unless you want to call simply perfect formula, application and wear, spectacular. Hmm, I do! It's a really nice brown. A true brown. And it's pretty dang shiny. Once I added TC it was just stunning. I added OPI Bring On The Bling from the Burlesque collection released for OPI's holiday collection in 2010. BOTB is gold glitter with what looks like some small glitter in various colors. To be honest though you really only see gold when you look at it on the nail unless you look super close.